Those of you familiar with the Star Wars Galaxies site will know that it regularly features a team member talking their past and other weird and wonderful things. Quite a few people who once worked on Wing Commander games are now working on Galaxies, and this week it is the turn of Chris Douglas to speak out about his Wing Commander days and being stalked by Mark Hamill. You can read what he has to say here. Thanks to Richard Hercher for pointing this out. Stephen Clark wrote to let us know that Tom Wilson aka Maniac will be at the FX-2002 show in Orlando. If you want to meet him in the flesh and maybe get an autograph, you can find out when, why, and how here. Howdy ho. Last chance to play Trivia Game Three ever is today. Week 52 answers due asap. Easy fun week. Happy happy joy joy. You heard the man! You can either email Chris your answers, or use our form. HCl has done yet more incredible work to his WC Movie Player.. by adding support for Privateer 2 movies! This is in addition to existing support for WC3 and WCP. The next (and final?) release will have support for WC4 movies. You can download the player and read the instructions on HCl's page. I'll just steal the description from our Fan Projects page. Time crisis is a tribute to the Wing Commander and Star Trek universe. It is an original fan project and is planned to be a simple yet addictive 2D Prince of Persia style game. However, the gameplay is aimed to be a lot more advanced and also involve team strategies. They are using the Mappy Map editor to create the maps and C++ to make the program. If you want to help, you can mail the project leader here. Hellcat reports that Vega Strike is ready for release except he needs your help! if you have some music that isn't copyrighted that fits one of those bills, please send it to me. So if you know what "LOD"s are or you can do a great impression of a mass driver, etc, then email Hellcat! Well possibly not, but this article on Wired.com details actions taken by EA against fan projects to recreate Ultima and Bard's Tale using modern technology. There's also a slightly humorous comparison involving Richard Garriott and The Wizard of Oz. Thanks go to TC for the heads-up. TyeDyeBoy noticed a little poll running over on TheOneRing asking "Which of these autographs would you be most happy to get?". John Rhys-Davies (aka Paladin) is on the list, so of course he is a good choice. Some of us are lucky enough to have his autograph already.. we did tell you to go to Dragon*Con. Followers of the Chat Zone will know that LOAF has been working on a much more complete map of the WC universe and now it is (more or less) finished! You can find the files here, and you are invited to email LOAF if you think you've found a mistake. In a related note, LOAF will going offline soon until around the middle of November due to further eye trouble. Well it's not quite, but until the next game starts it is. I'll let Chris do the talking. Welcome to Game Three, Week Fifty-Two Trivia. This is the final week of Game Three! Thank you very much to everyone who has played over the past year. It's been an especially tough and busy year for me, and seeing all the enthusiasm and continued interest in the vast history of the Wing Commander universe has been extremely encouraging each week. We're going to take a short recess after this week and break for a time before beginning Game Four. No firm timetable has been set, but we'll probably take about one to three weeks off. You'll hear about Game Four at the CIC main page as soon as we've made some decisions. I hope that the one hundred Game Three players and more return for our new game shortly. Anyhow, on to the last set of questions! They're not really trivia questions in the traditional sense, but your answers are worth credit and will help us form the basis of Game Four. They're for you to just get your ideas down on paper and have some fun. Please email answers to ChrisReid@wcnews.com. Be sure to include a name you would like to be known under for the Scoreboard. Have your answers in before this coming Sunday (October 28, 2001) to ensure your answers are recorded. Answers submitted early may be returned and you may be able to fix incorrect answers, time permitting. Main questions answered correctly are good for 5 points, bonuses good for 3. Question 103: What form would you like the next official Wing Commander project to take? Question 104: What is your fondest Wing Commander memory? Bonus 52: What would be a good question to ask in Game Four Trivia? You can also use our form to send your answers. There's still time to work your way up the scoreboard before trivia ends! Make sure you have your answers in to Chris via email or this form by midnight tonight. The last week of trivia game 3 begins tomorrow. An update over on the Unknown Enemy site (which has yet another new location!) details the latest going-ons in UE-land. First off, Pedro is working on missions 9 and 10, secondly Quarto is working on the ship viewer, and thirdly the CIC's very own Hadrian has completed a second CIC room for the project, though I hear the first will not be used now. Screenshots of mission 10, the ship viewer, and the complete CIC (in that order) are below. HTL continues with the second part of the Tiger Hunt series, which follows battles fought by the Border Worlders in the Loki system. As you'll recall from the first chapter, the Border Worlds carriers had headed into the ruins of Loki VI to act as bait, drawing the Nephilim after them while the rest of the Combined Fleet closes in for the kill. Here's Chapter 106 for your reading pleasure. It ain't just a domain name! SolSector.net is the latest addition to the CIC providing what we hope will be a permanent hosting solution for WC fan sites out there in need of a good home. I think the front page says it all..
SolSector.net is a free hosting service solely for Wing Commander sites. This latest part of the Wing Commander CIC is still in its very early stages so please bear with us as we finalize details. But we are still open for business! Webspace and bandwidth for your site (shared between hosted sites). If this sounds like what you are looking for, you can apply here. Here's the penultimate trivia week of game 3. It's very nearly your last chance to score some points, so either email Chris or use our form. Question 101: Who was one of the first Firekkans to pioneer spacetravel? Question 102: What situation surrounded the Kilrathi taking on majorspace flight? Bonus 51: What's the difference between an Akwende Jump Drive and MorvanHopper Drive? Submissions are due by October 21, 2001. Vega Strike Beta Needs You! HellcatV is nearly ready to send Vega Strike in to its beta phase, but he has a problem. But if you're good with polygons, you could help..
Vegastrike is almost ready to enter beta Just some sound development needs to finish... Unfortunately Vegastrike is Geometry limited.... For me to release the beta with a decent framerate I need Lower geometry ship models that I can swap in at certain distances. And I have no 3d modeller with which to shrink the number of polygons of my models! I would really appreciate it if people could take a look at the models I have here: http://reflection.dyn.dhs.org/3ds/vsorig and http://reflection.dyn.dhs.org/3ds and convert any they can read to versions with lower polygon counts so I can start specifying levels of details and support the battle of earth (>500 ships) Any help will be noted in the readme and on the website... I appreciate it! Please send me the models or upload them hellcatv@hotmail.com If you're curious how I know VS is geometry limited: It turns out in large ship battles (eg 400+) the framerate goes up from 4 fps to 11 fps by removing reflection calculations. This indicates that vegastrike's framerate for large numbers of ships is completely limited by the geometry being drawn. It has been brought to our attention by Christian Koch that the WCDC has had to close due to it outgrowing it's server. This is yet more evidence that the WC community is still alive and well, however it now means that several sites such as WC Invasion and HCl's Editing site are unavailable for the time being. We here at the CIC are working as quickly as we can to provide a hosting solution which we anticipate will be available in the next few days. If you have a WC site which you would like us to consider hosting, please email us here. Please be aware that both space and bandwidth are limited, so any indication of the current size of your site would be helpful. Asher Cross (who didn't send his email address) contacted us to let us know that WC is game of the week over at MobyGames. Or it was, as it is now Game of Last Week, but you can see the feature's page here. Naturally it comes along with some great reviews. 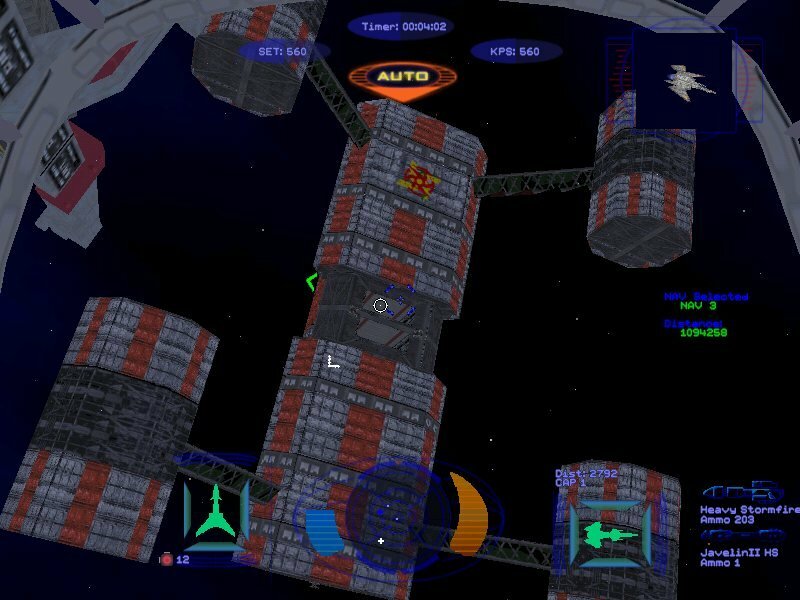 Death reports that an interview with Scott Brown, NetDevil President and Lead Designer on Jumpgate mentions Wing Commander as one of the games that inspired them. We have of course all played Elite, Wing Command, and XWing and have always wanted to play a MMP version of these games. Also, many of us read Sci-Fi and there are scenes from many books that are inspiring as well. We took what we thought was great from all these things added our own ideas and improvements and the result is Jumpgate." You can read this interview at PlayerofGames.com. Here's Raptor with the introduction to the next instalment in this Aces FanFic series. 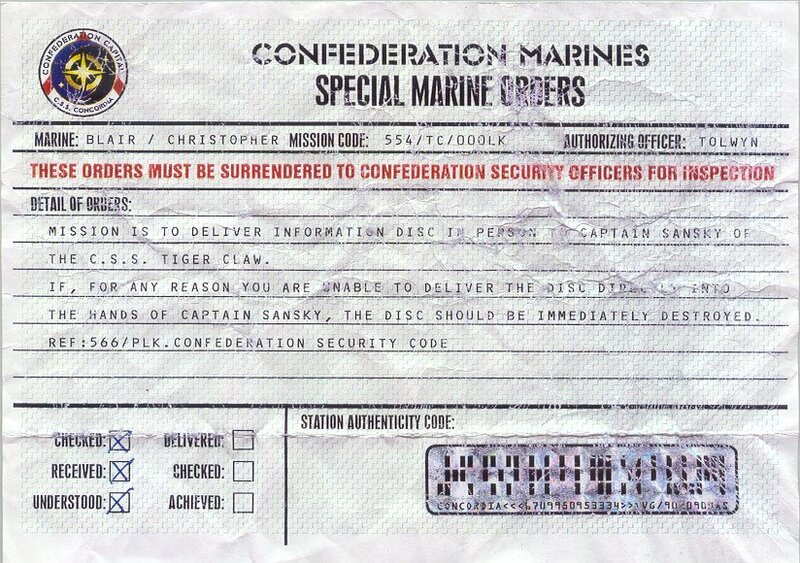 As you know, the Border Worlds military haven't been seen in an official Wing Commader product since WC4:TPOF, which is set in the early 2670's. Because of that, the state of the Border Worlds military in the 2680s isn't known. The assumption that we've used in HTL is that the Border Worlders at the time of WC:P are at roughly the same level *relative* to the Confederation that they were in WC:4. That's to say, most of their craft are roughly a generation (or a game, to put it another way) behind Confed's best. In WC4, they were mainly using WC2craft like Sabres and Rapiers, while Confed was using Hellcats and Excals and the like. Now, while Confed has moved on to Vampires and Panthers, the Border Worlders are still using Kilrathi War type craft, both those bought from Confed and native built craft that have similar abilities. The only exception is a handfull of advanced craft such as Retaliators and Stalkers, which like the WC4 Banshees and Vindicators, can foot it with frontline Confed craft on an equal basis. You can read Chapter 105 here. Remember to submit or e-mail your Week Fifty answers before the end of the day. Game Three is almost over, so get some practice in for the upcoming Game Four, when everyone gets a fresh start. Here are this week's questions again. - Question 99: Name the person that said: "If anything is going to happen to a pilot in the Morningstar, I want it to happen to me first." - Question 100: Name the person that said: "And finally, Ralgha, if you won't accept my recommendation that you select another wingman then I urge you to watch your back. Blair certainly won't." - Bonus 50: Name the person that said: "Now, I fight with men and women who would rather turn a cold shoulder then fly on my wing. And without trust, what purpose does a wingman serve?" While reading the Chat Zone (like everyone should), I noticed Napoleon mention that the WC Movie is being shown on USA tomorrow. I'll let him tell you..
Over on #WingNut (it seems news doesn't get emailed any more), CamW showed us a render of an Excalibur which he is working on. No word on when it will be done, but you can click the thumbnail to get a closer look. Only three chances left to prove your trivia excellence in Game 3! Please email your answers to Chris or use our handy form thing before this coming Sunday. Question 99: Name the person that said: "If anything is going to happen to a pilot in the Morningstar, I want it to happen to me first." Question 100: Name the person that said: "And finally, Ralgha, if you won't accept my recommendation that you select another wingman then I urge you to watch your back. Blair certainly won't." Bonus 50: Name the person that said: "Now, I fight with men and women who would rather turn a cold shoulder then fly on my wing. And without trust, what purpose does a wingman serve?" There is word over on the Chat Zone of a new play-by-email RPG starting up called the TCS Perilous RPG. So if RPGs are your thing, you can hit the site here. - Question 97: What events surrounded the end of the Pilgrim War in the mid 2630's? - Question 98: What events surrounded the end of the Firekkans' Confederation membership in the late 2660's? - Bonus 49: What events surrounded the end of the Kindred as it was known through the late 2790's? The easiest way to submit your answers is through our web form. You can also e-mail them to ChrisReid directly. Don't forget to include your name! I'll let Raptor introduce the next chapter in this Wing Commander Aces Fanfic. For those unfamiliar with the Tanfen Corp, it's a large and powerful mega-corporation that deals in everything from fighter and warship construction to raw minerals to consumer goods and foodstuffs. While it draws people from every part of human society, the predominant culture both socially and in the business arena is that of the Orient, especially Chinese. It has chosen to base itself in the Border Worlds Union because Union rules and regulations tend to be more flexible than those in Confed, and is the single biggest contributor to the Union's economy. In fact, Tanfen is probably one of the top three reasons for the rapid progress the Union has undergone in the years since its independence. Tanfen's founding families, their employees and dependants, several thousand people in all, have colonised two worlds that are part of the Union. Because of this, Tanfen enjoys a large degree of autonomy in how it operates. The colonies can set their own local laws just like other Union worlds can, subject only to the central Border Worlds government and the common law of the Union. They can also raise and maintain their own militia forces to defend themselves and their interests, subject to the jurisdiction of the Border Worlds military. Overall, the relationship between Tanfen and the Union Government is a symbiotic one. Tanfen has more freedom than it would enjoy anywhere else, and the Union benefits immensely from the billions of Credits that Tanfen pumps into the economy in the form of taxes and wages. However, in times of trouble, Tanfen's focus on profit and looking after its own people first and foremost can put it into conflict with the Government. It remains to be seen whether the two can co-operate to their mutual advantage during the Nephilim invasion, or if the differences will prove disastrous for both. LeHah emailed WC3, WC4 and Prophecy composer George Oldziey with a couple of questions. Here's what he had to say..
To answer your first question, I did not sample any real instruments or use any live players on WC3, though that's not the first time someone thought I did. The only sounds I used for the video scenes (all the game play was MIDI) were from the Kurzweil K2000 orchestral ROM set and a few from the Roland Sound Canvas. There was one particular solo trumpet patch in there that did sound pretty realistic in the mix. To answer your other question, I've been involved in other projects lately as well as dealing with the aftermath of the attacks. My dad was on the 72nd floor of the WTC when it was hit. He's ok, but I was a mess for a while. I did send an email just a few minutes ago to EA legal to reopen the discussion. At this point I think it should not take too long to find out what it will cost me to license the music. Then I'll send you a note. After seeing our recent update about Chris' WC movie flight suit, Tannim, who also recently acquired a flight suit, sent in pictures of a couple of things we didn't cover. A name tag belonging to Lieutenant Young which was attached to the suit, and a paper copy of Blair's orders which were also with the suit for some reason. There are little touches that remind you this is developed by the Wing Commander folks (besides the intro title stating once for all that this is a "Roberts Brothers Production") - there's the aformentioned Pegasus NavCom cameo, and the Mantis and Celereons pull duty for the Kilrathi and Nephilim (or Zerg and Protoss - though the races aren't nearly as varied as in Starcraft). Either the folks at DA have been taking good notice of Prophecy, or bugs are just really popular baddies. You can read the whole thing here. Registered users can also vote on the review. This week Tye will be hosting Wing Commander Academy Episode 5, "Lords of the Sky." You can download it here. We also have our Lord Nightwalker mirror here. Happy downloading. For those interested, the WCA segmenting has stopped dead with Tye's new server measures, but plenty of people are still getting it, too. The new trivia for Week Forty-Nine is now up. Scoreboard and such are delayed a bit however. As I mentioned before, I am taking comments on the end of this game at Week Fifty. Question 97: What events surrounded the end of the Pilgrim War in the mid 2630's? Question 98: What events surrounded the end of the Firekkans' Confederation membership in the late 2660's? Bonus 49: What events surrounded the end of the Kindred as it was known through the late 2790's? You can email your answers to ChrisReid@wcnews.com or submit the form here.